Medium-sized to large, terrestrial, perennial, often deciduous plants. Rhizome erect to procumbent, massive, with large, stiff scales at the apex and thick flashy roots. Fronds weakly dimorphic, tufted, coriaceous, stipes with numerous vascular bundles. Lamina pinnate with a free conform terminal pinna, glabrous when mature. Pinnae large, petiolate; lower ones sterile, upper ones usually fertile, fertile pinnae of the same shape as the sterile ones but usually narrower; veins forming a network without included veinlets. Sori covering the entire undersurface of the fertile pinnae (sporangia acrostichoid), exindusiate. Derivation of name: acros: top, stichos: row; the sori are often found in the distal part of the pinnae. Worldwide: c. 3 species, pantropical and warm-temperate distribution. 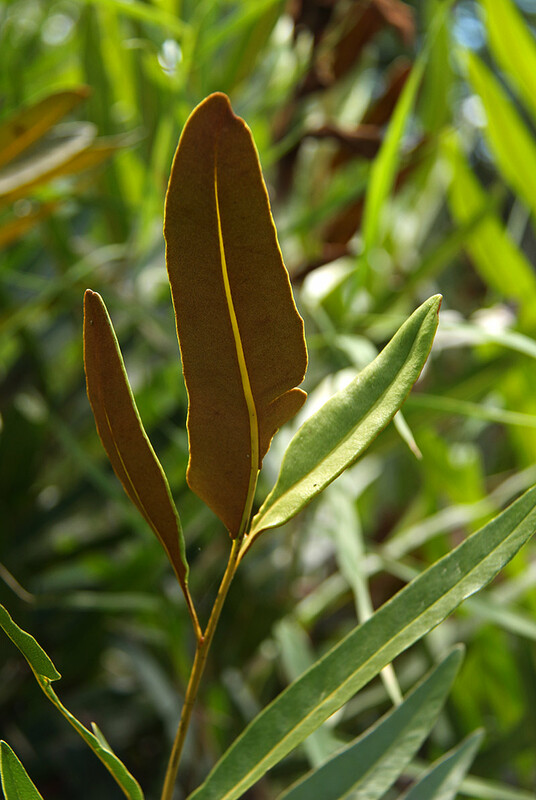 We have 1 taxa in the database for Acrostichum.